14kt. 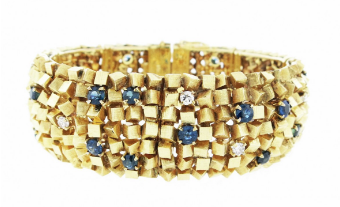 yellow gold stacked cubist style bracelet. 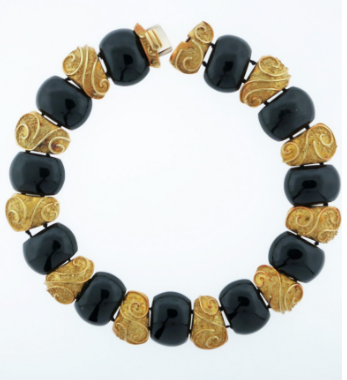 The bracelet measures 7 inches in length and 3/4 inches in width weighing 95.8 gr. 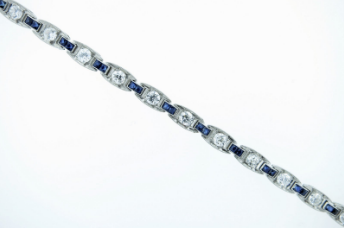 The fluid link bracelet is sprinkled with 23 prong set natural faceted blue sapphires totaling approx. 2.5cts. and 9 round brilliant cut diamonds totaling approx. .50cts. Circa 1970. Contemporary 14kt. 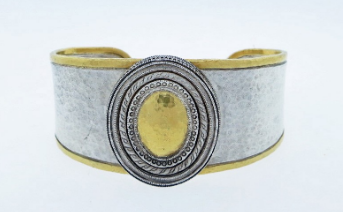 yellow gold two finish cuff bracelet measures approx. .80cts. in width. 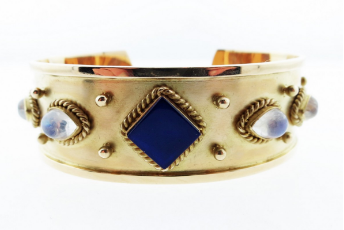 The cuff is bezel set in the center with a square of rich blue lapis lazuli and bezel set with two moonstones with rope detail. The cuff will fit most wrists. Signed Maz. Finely made elegant and very wearable platinum Art Deco bracelet circa 1920. Bead set with 20 round European cut diamonds totaling approx. 2.0cts grading VS clarity H color. Each connector link is bead set with 2 French cut natural sapphires totaling approx. 1.7cts. Bold design cuff bracelet made by the innovative Turkish designer Gurhan. The cuff measures 1.25" wide and tapers to the back gracefully. The finish is hammered and softly finished. The bracelet retailed for $4450 and is in new condition. 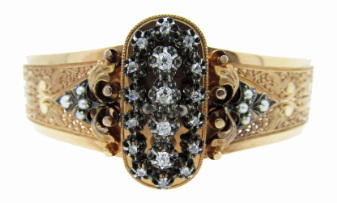 Contemporary pair of 18kt. yellow gold flexible cuff bracelets. Each bracelet is strung with five 10.0mm. AAA pearls with three alternating diamond pave balls across the top. Each ball is bead set with 36 round brilliant cut diamonds totaling approx. 2.5cts. grading Vs clarity G color. The bracelets will fit most wrists. 18kt Rose Gold Antique French Bangle Bracelet. 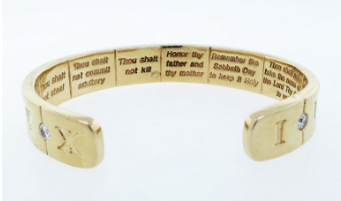 Exceptional Unisex custom made cuff with Biblical engraving. The outside of the cuff is deeply engraved with Roman numerals alternating with 9 round brilliant cut diamonds totaling approx. 1.65cts. grading VS clarity G color. The inside is expertly engraved with the Commandments. The bracelet is substantial weighing 64.9 gr. The bracelet will fit most wrists. Excellent condition circa 1980. Classic necklace made by the Italian jeweler Roberto Coin. The 18kt. 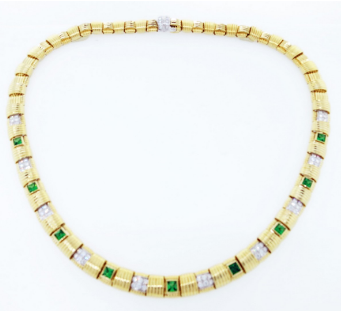 yellow gold necklace measures 16 inches in length and is set with alternating squares of 6 pave set round brilliant cut diamonds in white gold with square faceted natural faceted green garnets. The paved catch is signed on the back with the hallmark of quality ruby accent. Dramatic ancient Greek inspired necklace made by Lalaounis in high color 18kt. yellow gold. The necklace measures 14 inches in length. The necklace weighs 106.7 gr. Circa 1980. Estate Elizabeth Gage necklace circa 1980 consisting of alternating graduating lozenge shape 18kt yellow gold sand and wire work links with pillow shape black onyx sections strung on silk. Fluid 18kt. 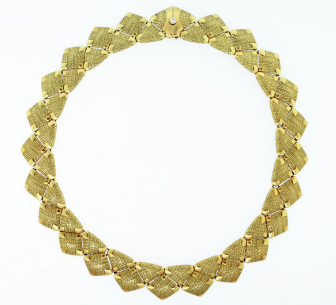 yellow gold quilted pattern link necklace made by Alex Sepkus. The necklace measures 18 inches in length and 3/4 inches in width. The catch is bezel set with a round brilliant cut diamond. The necklace weighs 156.9 gr. signed Alex Sepkus numbered #027. Circa 1900. 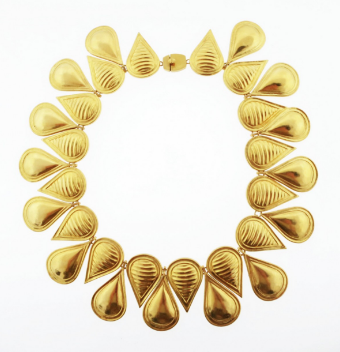 Fabulous modernist design necklace made by the re-nowned Brazilian jeweler Burle Marx circa 1970. The textured finish 18kt. 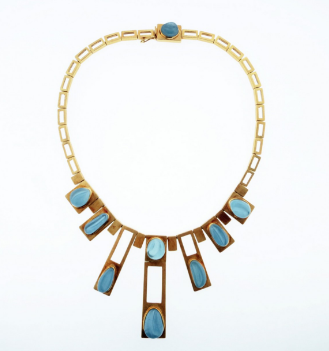 geometric necklace measures 16 inches in length and is set with nine carved aquamarines. Excellent condition! 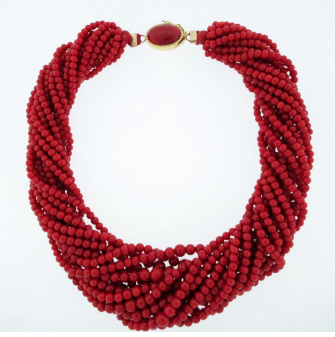 Stunning fifteen stands of natural oxblood coral beads measuring approx. 17 inches in length and can be loosely or twisted to be worn as a choker. Each strand graduates from approx. 4mm. to approx. 7.0mm. with a cabochon 18kt. yellow gold mounted catch. 14kt. 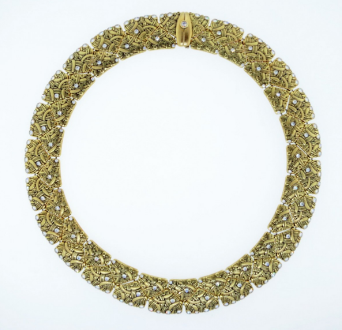 yellow gold tapering fringe necklace circa 1980. The front of the necklace is accented with 17 baguette cut diamonds totaling approx. 1.0cts. The necklace measures 18 inches in length. Made in Italy. Handmade 18kt. yellow gold airy open work bib necklace made by the contemporary jeweler Robert Lee Morris. 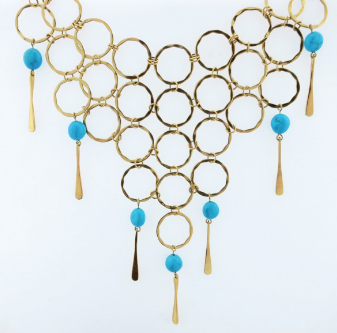 The hammered links have seven oval faceted turquoise bead drops. 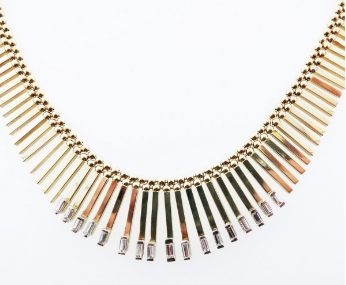 The necklace measures 17 inches in length with five inch drops. 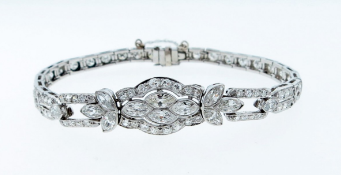 Handmade platinum mount diamond bracelet circa 1925. The center is set with 12 marquise cut diamonds and 62 old European cut diamonds totaling approx 3.5cts. grading VS clarity H-I color. The bracelet measures 7 inches in length. 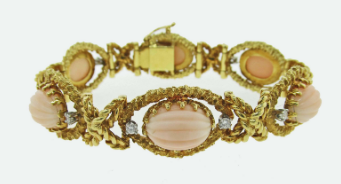 Cellino Fluted Angelskin Coral and Diamond Bracelet. 18kt. yellow and white gold hinged fluted slightly tapering cuff measuring approx. 3/4 inches width in the center. The center panel is set with a fluted carved onyx, the side panels are set with fluted carved rock crystal. There are four diamond sections bead set in white gold with 36 round brilliant cut diamonds totaling approx. 1.8cts. The cuff will fit a small to average wrist .Circa 1970. Very good condition. Fluid 18kt. yellow gold diamond link necklace made by the esteemed jeweler Alex Sepkus . 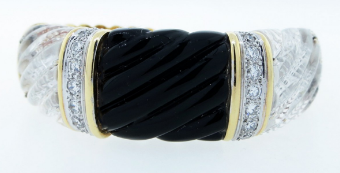 The links are bezel set in the intricate detailed mount with 6.8 cts. of round brilliant cut diamonds. The necklace measures 15.5 inches in length and approx. .75 inches in width. weighing 147. gr. a proven classic! Antique 14kt. 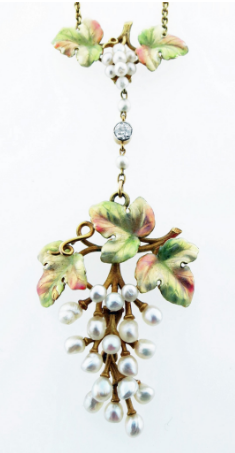 yellow gold necklace in a grape vine design circa 1910. The necklace is enameled in soft tones of pink and green. The pearls are natural with a round European cut diamond accent. The necklace measures 20 inches in length. Wonderful condition! Original patina 14kt. 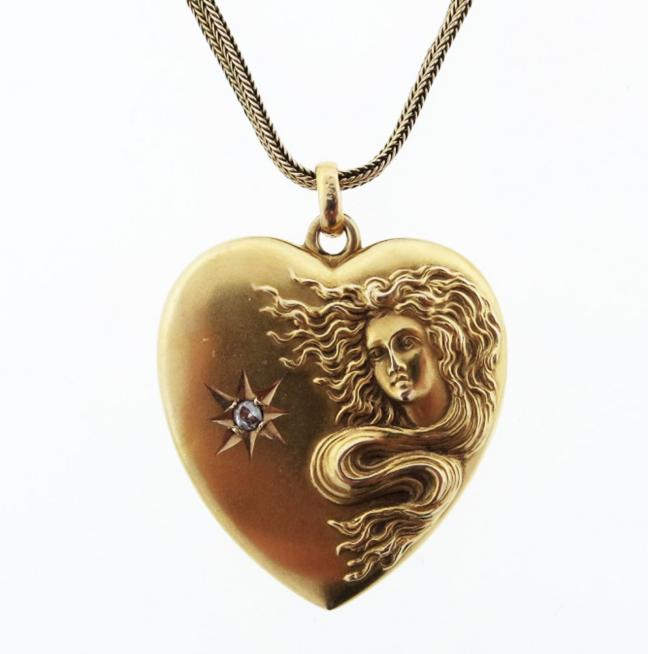 yellow gold Art Nouveau heart shape locket measuring approx. 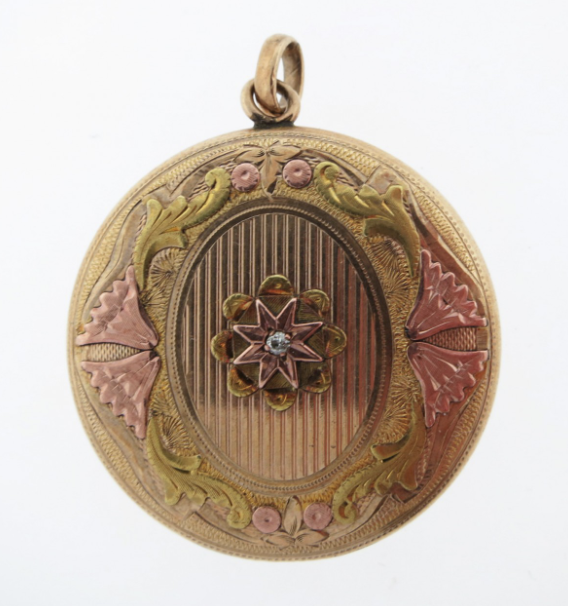 1.25 inches in length with a high relief female figure on the front with an accent diamond. The back is engraved with flowing script initials. The 14kt. yellow gold cable link chain measures 15 inches in length. Double original frames intact. Circa 1910. Spectacular 14kt. 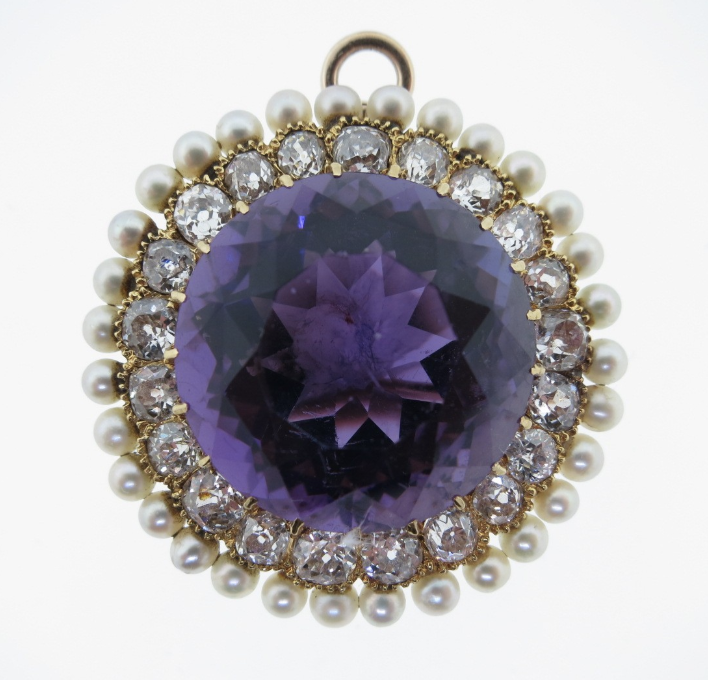 yellow gold round faceted natural gem color amethyst pendant brooch, the prong set center amethyst weighs approx. 18.0 cts. surrounded with 21 cushion cut diamonds totaling approx. 3.0 cts. and 31 natural 2.5 mm. pearls. The 14kt. 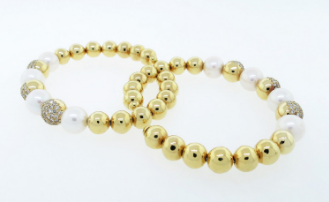 pearl chain measures approx. 50 inches in length. Circa 1880.